My Del Real Food Contest Creation! I’m having a lot of fun this week! I found out about a fun contest through the San Diego Food Blogger Group where I could request specific items from the company Del Real Foods (http://www.delrealfoods.com/), they would send me the items free of charge, and I could play around with the ingredients in order to create a recipe and win some cash. Uh, yeah! I requested shredded chicken, carnitas, refried beans, and salsa and started playing around with quick recipe ideas. The only stipulation was that the recipe couldn’t take longer than 30 minutes. Not a problem, especially with the main ingredients precooked. You can vote for my recipe, Picante Pollo Sliders, here: http://www.delrealfoods.com/blogger-recipe-challenge/picante-pollo-sliders You are allowed to vote once a day through August 7th. Of course I would love to win the cash prize, but I must say it is really fun to see so many people supporting me. I keep watching the vote count go up every day, and that is just really cool! This is a keeper of a recipe! You can make the cucumber relish the day before, if you so choose. The longer the mix sits, the more intense the flavors will become, of course! The chicken mixture will come together quickly, but you can also keep it simmering on the stove for a good amount of time so that it thickens. Just keep an eye on it and occasionally stir. But if you don’t have a ton of time, no worries. Follow the recipe as is, but you may want to make sure more chicken than liquid makes it onto the slider so that it doesn’t become too soggy. Last note, this recipe makes a large serving. I like to be able to really pile the chicken mixture onto the slider, but you may not be so brash. If you have extra chicken mixture, either get more slider buns or you could mix up dinner the next night by cooking some penne and adding this chicken mixture in lieu of a traditional tomato sauce. That is exactly what I did, and then I added some lightly sautéed zucchinis. Why not? Go crazy! 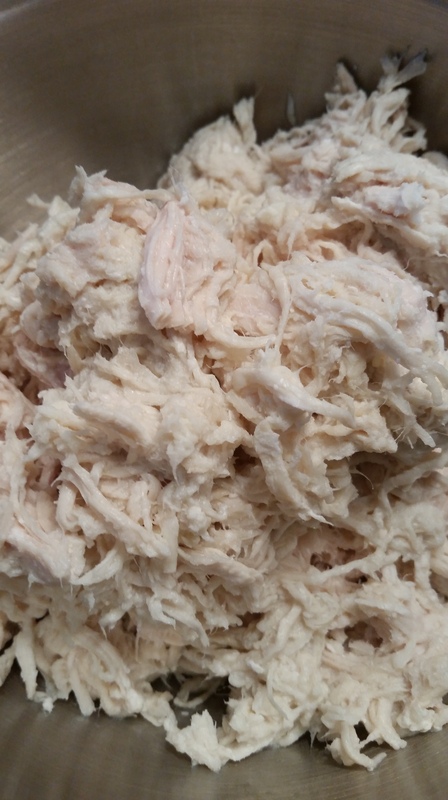 This is how I received the chicken – perfectly cooked and shredded with zero fat. I felt spoiled! 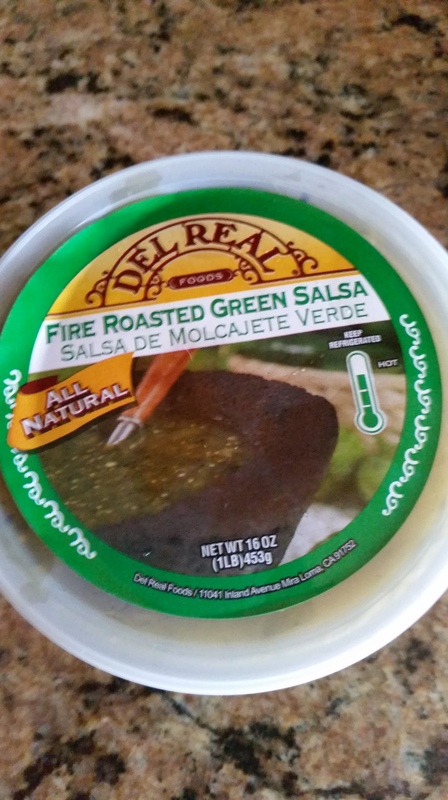 The Fire Roasted Green Salsa was delicious in this recipe or even on its own! In a food processor, combine red jalapenos, vinegar, garlic, sugar, ginger and salt. Process until well combined, about 1 minute. In a medium bowl, place cucumber slices, onions and cilantro. Pour jalapeno mixture over the cucumber mixture and mix together. Cover and place in refrigerator until ready to use. In a large pot, place shredded chicken, salsa, chipotle chiles, and chili powder over medium high heat. Stir to combine, and continue stirring occasionally until heated through, approximately 20 minutes. Once the chicken mixture is thoroughly heated and the flavors have combined, place a scoop of the mixture onto the sweet roll. You will want to slice the roll like a sandwich. Top the chicken mixture with a bit of the cucumber relish and then top with a bit of crumbled cotija. Top the slider with the top half of the roll. The amount of the chicken mixture, cucumber relish, and cotija really depends on one’s personal preference. Now you can see all of the goodness! At this point, I had Refried Beans and Carnitas (Roasted Pork) from Del Real Foods that I wanted to turn into even more goodness. I turned to another love for inspiration – pizza. Again, I only had 30 minutes from start to finish. 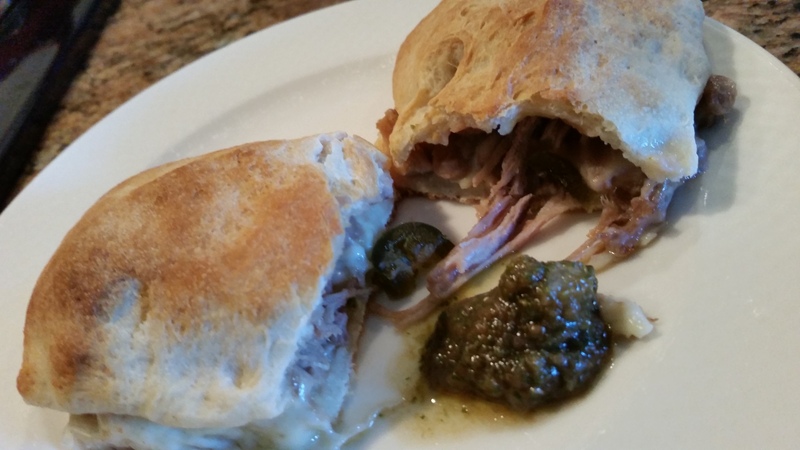 I created, but opted not to enter into this into the contest, Cheesy Carnitas Pillows. Simply take 1 store-bought container of pizza dough and roll it out onto a prepared baking sheet. I sliced the dough into 10 equal rectangles. On the bottom row of 5 rectangles, I placed 1 slice of Jalapeno Monterey Jack, making sure the cheese did not hang off the edges. 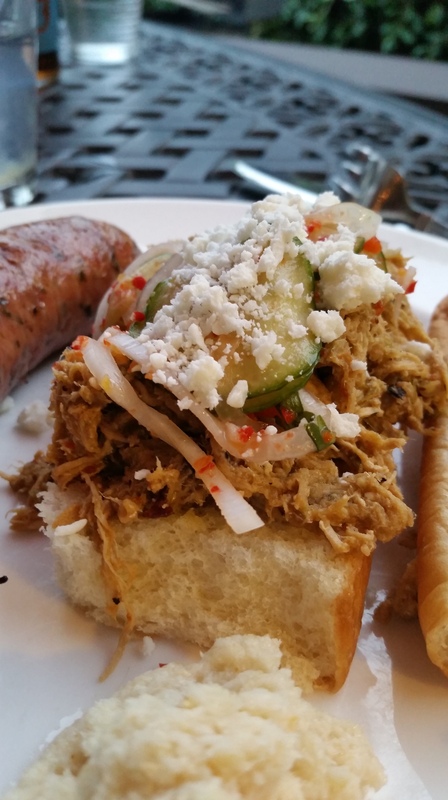 I spread 2 Tablespoons of refried beans on top of the cheese, then I topped that with 1/2 ounce of carnitas, and layered that with 3 pickled jalapeno slices. I simply took the top row of dough and placed them on top of the prepared dough rectangles, and then I crimped the edges to ensure no goodness would escape. I baked them for about 15 minutes, or until nice and golden, at 425 degrees. I served these little lovelies with salsa. Thanks to everyone who has already voted, and feel free to continue to vote whenever you have a free moment! I greatly appreciate it!